Bridgeport Vertical Mill w/ 1.5Hp Motor, 60-4200 Dial Change RPM, 9” x 36” Table. Craftsman “Mill-Drill” Vertical Mill w/ 1.5Hp Motor, 12-Speeds, R8 Spindle. Boyar Schultz “Six Twelve Deluxe” 6” x 12” Surface Grinder s/n 20087 w/ Suburban Magnetic Chuck. Delta 4” Belt / 6” Disc Sander. Delta 1” Belt / 5” Disc Sander. Hardinge mdl. HC Hand Chucker s/n HC-2858-H w/ 125-3000 RPM, 8-Station Turret, Power Feeds, 5C Collet Closer, Coolant. Hardinge mdl. HSL Speed Lathe w/ 5C Collet Closer, Stand. 2006 Haas Super VF-2SS 4-Axis CNC Vertical Machining Center s/n 1051962 w/ Haas Controls, 24-Station Side Mounted ATC, CAT-40 Taper Spindle, 12,000 RPM Spindle, Haas VOP-B, Inline Direct Drive Spindle, High Speed Tool Changer, Brushless “A” Axis, Rigid Tapping, 34-Position Coolant Spigot, Coordinate Rotation and Scaling, M19 Spindle Orientation P & R Codes, Quick Code, 208/230 Volt, USB Port, Chip Auger, 14” x 36” Table, Coolant. 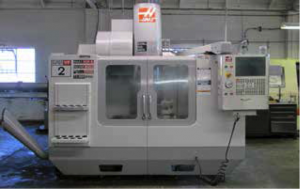 2000 Haas VF-4 4-Axis CNC Vertical Machining Center s/n 23320 w/ Haas Controls, 20-Station ATC, CAT-40 Taper Spindle, 7500 RPM, Brushless Servos, 4th Axis Brush, 1mb Extended Memory, Programmable Coolant Nozzle, Quick Code, Coordinate Scale and Rotation, Rigid Tapping, Hand Wheel, Chip Auger, 18” x 52” Table, Coolant. 1997 Haas VF-2 4-Axis CNC Vertical Machining Center s/n 10139 w/ Haas Controls, 20-Station ATC, CAT-40 Taper Spindle, 7500 RPM, Brushless Servos, Programmable Coolant Nozzle, Quick Code, Rigid Tapping, Floppy Disc, Chip Auger, 14” x 36” Table, Coolant. Hardinge CHNC II CNC Chucker s/n CN-2138-A2-16 w/ Fanuc GN 10 Series Controls, 8-Station Turret, AC Servo Drive Conversions, 16C Spindle, Coolant, Hardinge Pneumatic Bar Feed. Hardinge CHNC II CNC Chucker s/n CN-2006-A2-16 w/ Fanuc GN 10 Series Controls, 8-Station Turret, AC Servo Drive Conversions, 16C Spindle, Coolant, Traub Hydraulic Bar Feed. 1990 Hardinge “Conquest 42” CNC Slant Bed Lathe w/ Fanuc Series 0-T Controls, 12-Station Turret, Parts Catcher, 16C Spindle, Coolant, LNS Hydrobar mdl. 6.42HS-5.2 6-Tube Hydraulic Bar Feed. Hardinge “Conquest 42” CNC Slant Bed Lathe w/ Fanuc 0-T Controls, 12-Station Turret, Tailstock, Parts Catcher, 16C Spindle, Turbo Chip Conveyor, Coolant, Hardinge Hydraulic Bar Feed. Hardinge “Conquest 42” CNC Slant Bed Lathe s/n CS-8220 w/ Tool Presetter, 8-Station Turret, Tailstock, 16C Spindle, Coolant. Mori Seiki SL-3H CNC Turning Center s/n 5330 w/ Yasnac Controls, 12-Station Turret, Hydraulic Tailstock, 10” 3-Jaw Power Chuck, Coolant. MicroVu mdl. H14 14” Floor Model Optical Comparator s/n 3332 w/ MicroVu Q16 Programmable DRO, Surface and Profile Illumination, 5” x 18” Table. Starrett and PZO Tool Makers Microscopes. Sunnen PG-800-S Precision Bore Gage. Sunnen PG-500-S and PG-400-S Setting Fixtures. Cadillac Pla-Chek 6” and 12” Height Masters. Mitutoyo 18” Vernier Height Gage. 36” x 48” x 6” and 24” x 36” x 6” 2-Ledge Granite Surface Plates w/ Stands. Clark C300-50 3575 Lb Cap LPG Forklift s/n 356-852-4631 w/ 3-Stage Mast, Cushion Tires. Amada HA-250 Automatic Hydraulic Horizontal Band Saw s/n 458992 w/ Hydraulic Clamping and Feeds, Coolant. (2) Roll-In Vertical Band Saws w/ Manual Clamping. Butler 15Hp Horizontal Air Compressor s/n 2831 w/ 2-Stage Pump, 120 Gallon Tank. Yuasa “Accu-Tap II” Geared Head Tapping Machine s/n 112173. Craftsman Pedestal Drill Press w/ Procunier mdl. 1 Tapping Head. Burgmaster 6-Station Turret Drill w/ 8” x 12” Table. (2) Famco Arbor Presses w/ Stands. Haas 4th Axis 6” Rotary Head w/ Pneumatic 5C Collet Adaptor. (2) Haas HA5C 4th Axis 5C Rotary Heads. (2) Kurt 4” Double-Lock Vises. 5C Indexing Head and Mill Center. Tap-Master Precision Tap Sharpening Fixture. (2) Randel “Quick” Knurling Tool Sets. Adjustable and Fixed Angle Plates.